Bushcraft Survival Black – A razor sharp blade with its black 3.2 mm thick blade is one of the most sturdy knives Mora have ever made. The carbon steel blade has a black coating which protects against corrosion. Purchase through PayPal by using the "Add To Cart" button above or use the form below to order the Mora Knives Bushcraft Survival BLACK Heavy Duty . 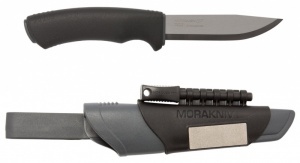 Feel free to contact us if you have any questions about the Mora Knives Bushcraft Survival BLACK Heavy Duty .